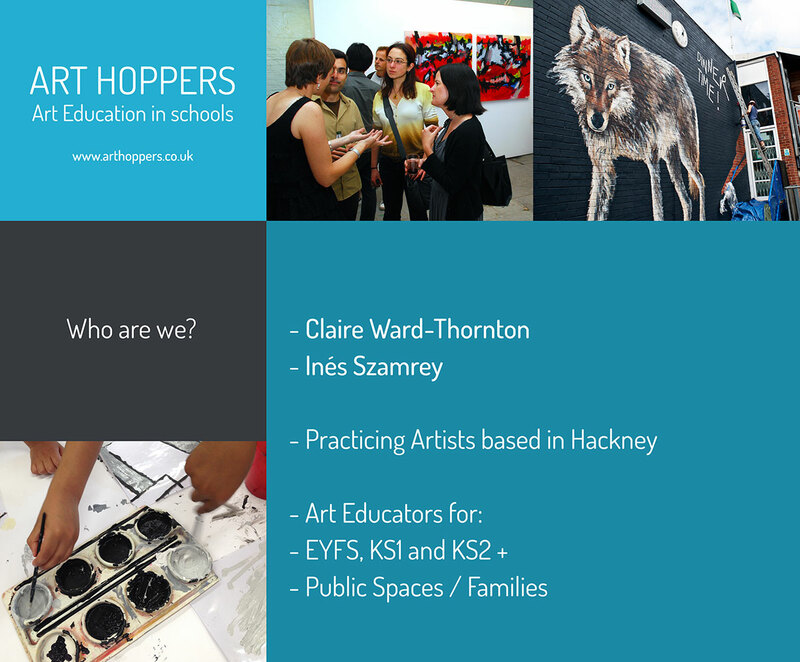 Art Hoppers is a London (Hackney) based art education organisation which was established by artists Claire Ward-Thornton and Inés Szamrey in 2012. Ines moved to Argentina in 2016 and plans to establish her own branch of art education there. Claire continues to manage Art Hoppers in London with a small team of creatives. 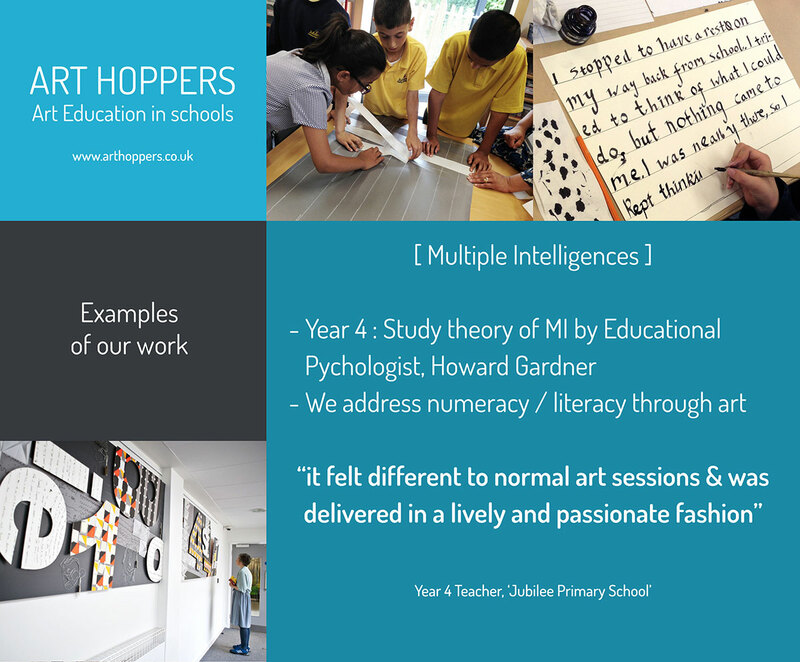 We design and deliver high-quality art activities for early years, primary school children and families in both educational settings and public spaces. 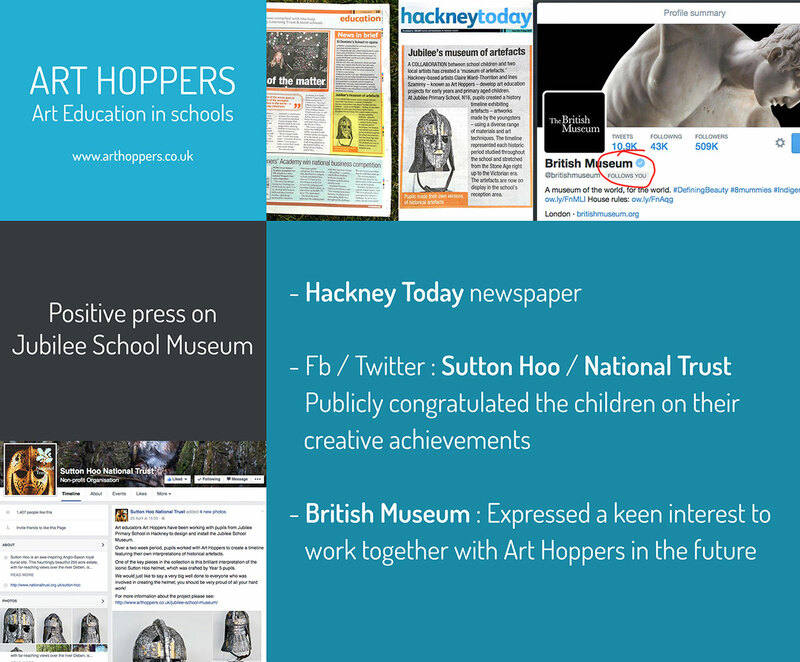 We trust in children’s art – We elevate their work by exhibiting it within a gallery quality context. Our projects aim to showcase children’s art at it’s absolute best. We work to commission on bespoke projects in response to the aspirations of our clients and their settings. 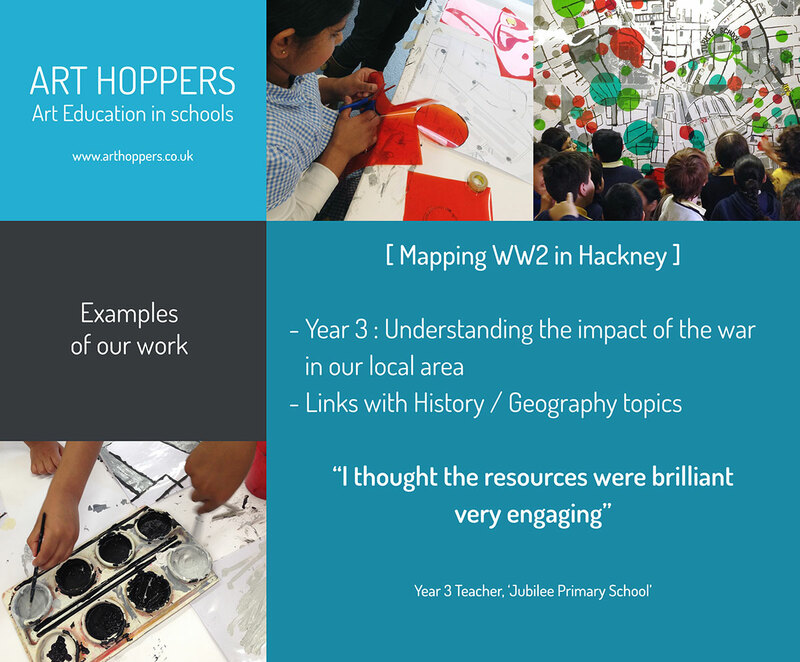 Within schools, our work usually takes inspiration from the curriculum. Do you work together with school teachers? Yes. 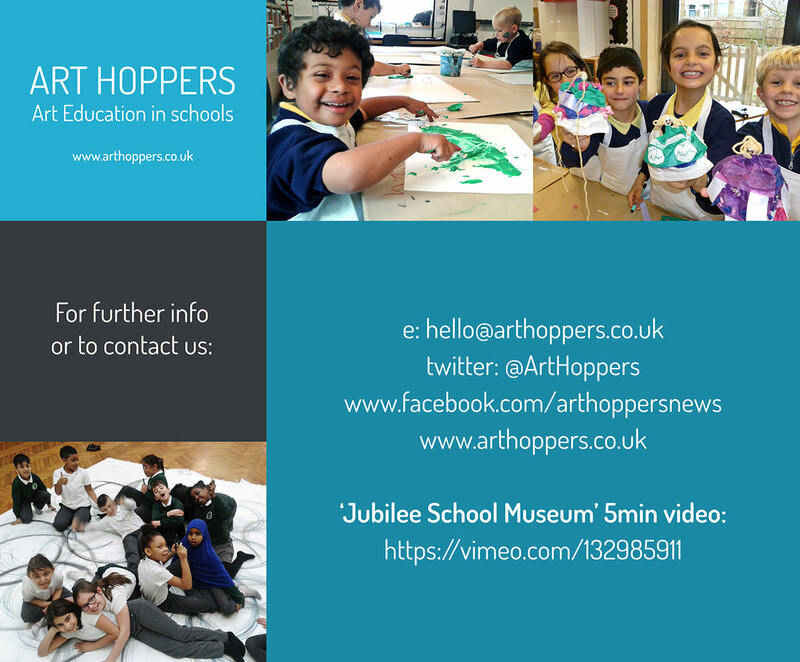 We request that all schools offer their staff planning time with us in the lead up to the art sessions. 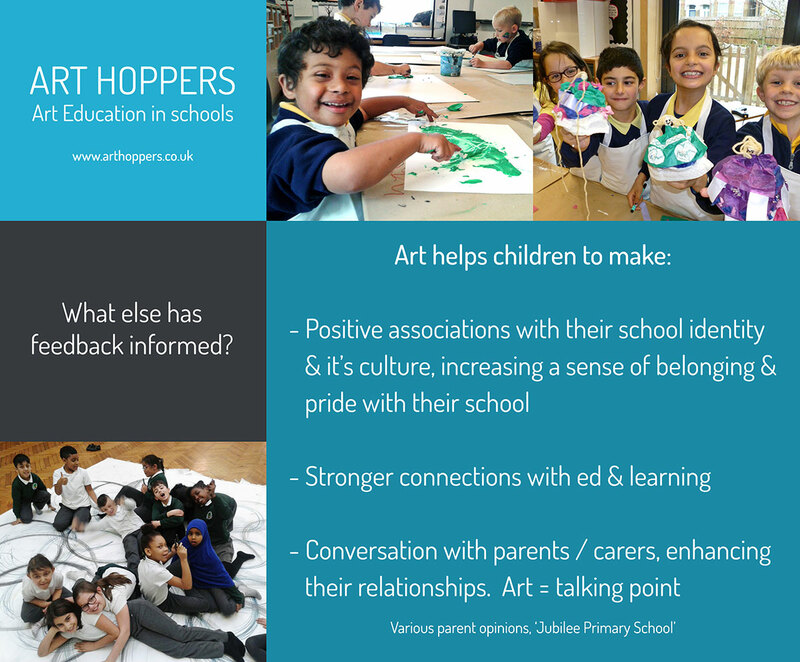 With this relationship in place, incredible outcomes regarding our role in the classroom, the childrens’ engagement and the standard of the artworks is absolutely possible. Usually toddlers to pre-teens and adults. In schools, we are happy to work with one or more year groups in a given project. We have in many cases worked across the key stages from reception to yr 6 within one project. Have you worked with SEN children? Yes. Our project ‘SEN Rules’ at Jubilee primary was designed specifically with SEN children in mind. The project was achieved though a close working relationship with staff and the involvement of class buddies for each child. Each project has it’s own theme or point of focus. 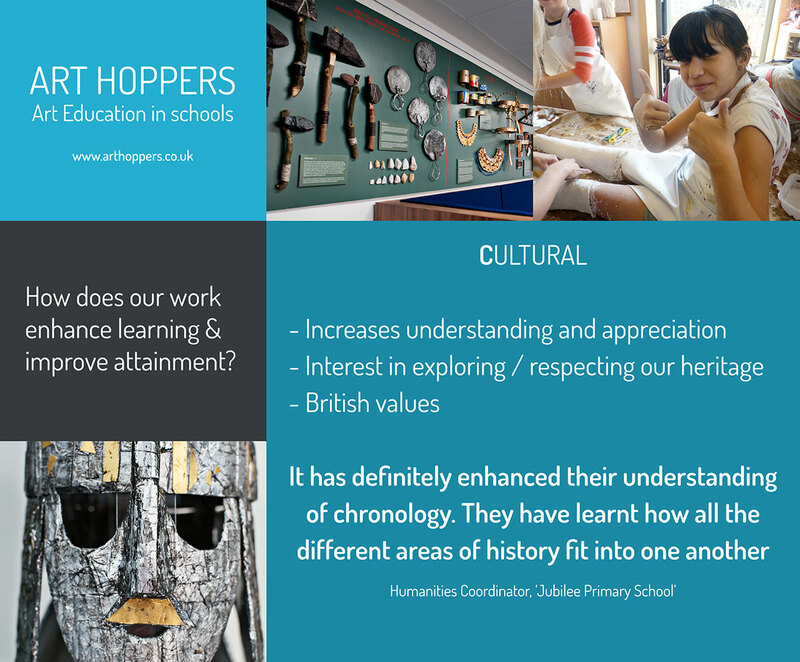 This can be drawn from a specific class topic which the children are studying or more broadly a subject area i.e. history. Schools have also requested we design art projects around their specific values. The options of what we can achieve together are open. This is equally the case in our relationship with public spaces. What art techniques do you use? We use many different art techniques from drawing, painting and printing to 3D modelling, sculpture and mixed media. We apply the art techniques which best suit the ideas and goals of each project. The excitement for us is in generating ideas – Dreaming up new creative adventures… Every project offers a new beginning and is very different as a result. We love the opportunity to work with new people. We’re very much team players. We also get a great deal of enjoyment from working with young minds. Children have an incredible way with art – Their enthusiasm and curiosity is what makes our job so rewarding. We trust in children’s ideas. We value the unique qualities of their art and love the energy that they bring to the creative process. 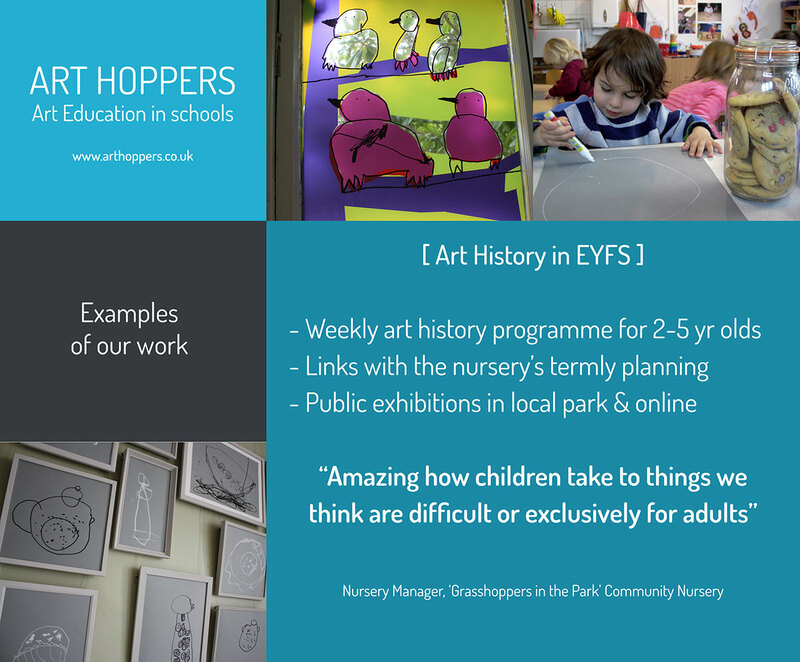 Children – particularly early years and primary aged children – have a freedom and openness to art which enables them to surprise, charm, inspire and ultimately connect adults to their world in ways which are often insightful and memorable. We’re keen to share and promote the inherent creativity of children and to help them see and fully appreciate these talents for themselves. 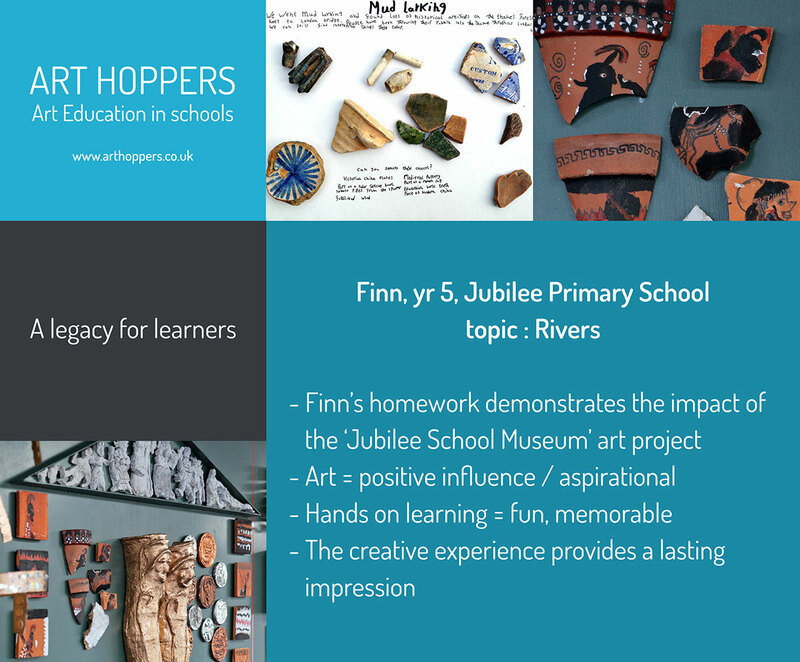 Our aim is to explore the potential of ideas with children, to take them through the complete process of art making, from finding inspiration to taking pride in the final exhibits. Presentation and context are hugely important to us. We apply childrens’ art to a professional quality platform, be that a space or a product with the aim of presenting their artistic skill at it’s absolute best, giving it the integrity it deserves. Art for us is about ideas. In understanding a work of art, we become art detectives aiming to unravel the message the artist wants to convey. Equally, in making art we have challenges to solve and stories to build. 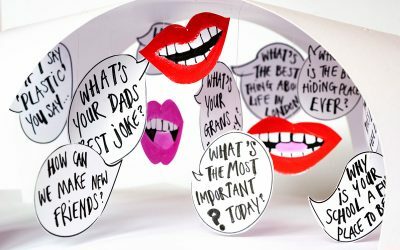 Art raises the bar on communication, exploration, and thinking in new and exciting ways … Enjoying the adventure, recognising what’s being achieved and valuing the fun of it all is a big part of the journey too. Claire is a London based illustrator and print designer with BA (Hons) Fine Art, Uni of Plymouth, Exeter. Previous experience in the arts is broad having been an independent artist (in partnership) on the live art scene plus experience of work in theatre, TV/film and large scale outdoor events. Claire is an experienced scenic painter and has worked to commission on various murals and in assisting others. Claire managed an arts and mental health charity for a period of six years bringing music and theatre to hospitals and day centres. Her design label ‘CWT’ presents fabrics and a collection of handmade products for retail. Inés Szamrey is an Argentinian artist who graduated from Figueroa Alcorta School of Arts, Cordoba, Argentina with a Bachelor degree in Fine Arts and Arts Education and received a Gold Medal for her performance in the programme. 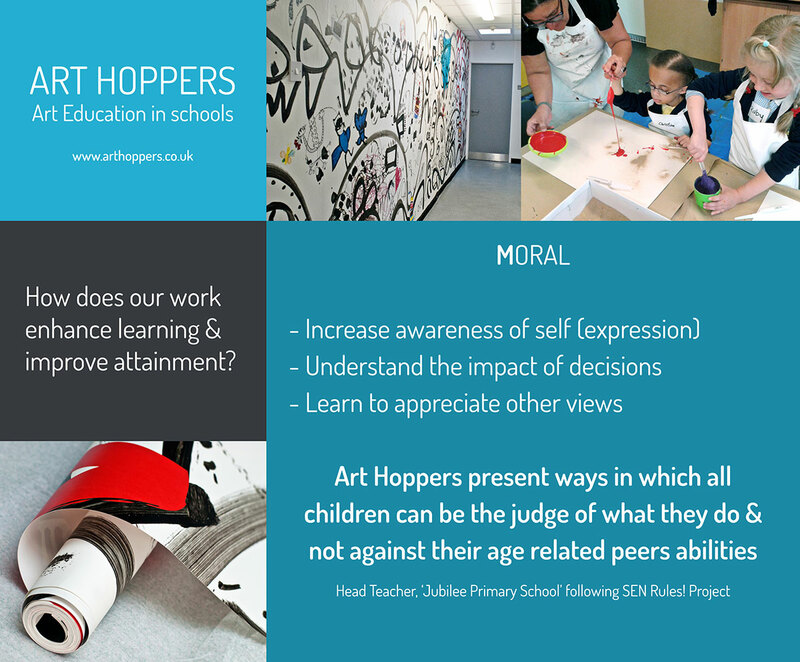 Inés has worked as an Arts Facilitator for a number of organisations in Argentina and the UK and together with Claire, founded Art Hoppers in 2012. Her work as an artist is intricately connected to the production of art in the early years and is based on inverse learning from the work of the Child to the educator. Inés returned to Argentina in 2016 and plans to establish her branch of Art Hoppers there (watch this space!). 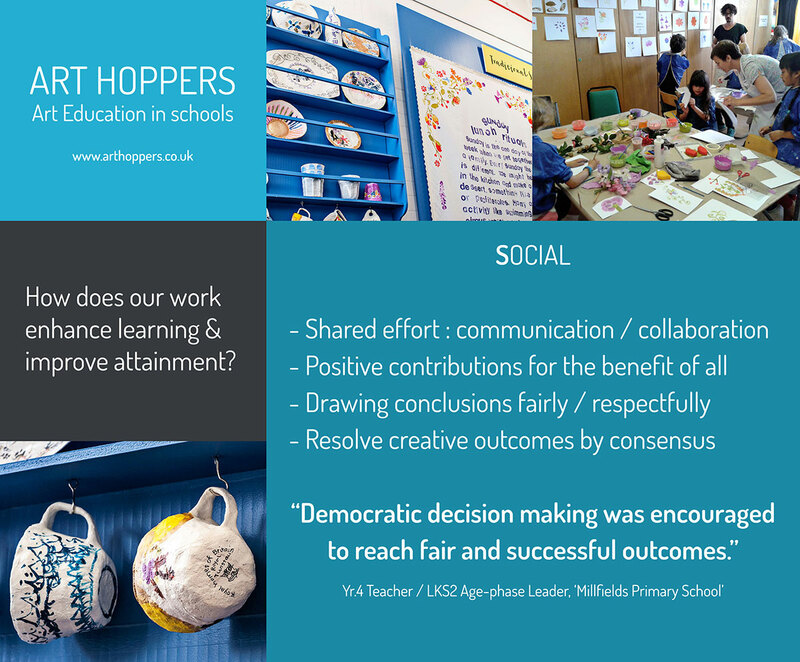 Here’s a presentation (dated July 2015) which summarises some of our early work and hi-lights the benefits of what we do in schools.